Saw some bird-like pineapple tarts in the newspaper ads and thought I could give it a try too. Just for the sake of fun. The end product wasn’t too bad, but there is definitely room for improvement (see my comments below). Refer to my blog post ‘Home-Made Pineapple Tarts For Melting Moments‘ for the recipe. To make the shape of the rooster, roll the filled pastry dough into a log shape first, and then sharpen one side gently by rolling that side once or twice more. 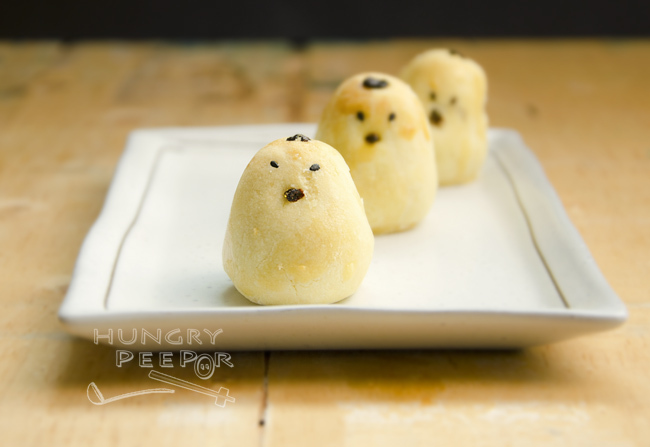 Use black sesame seeds to make the eyes of the roosters. I used wolfberries that have been snipped into triangular shapes to make both the beaks and the crown of the rooster. These didn’t take to the high heat of the oven very well – they got burnt and became black (but tasted alright though haha…). If you’d like to play it safe, roll out a small chunk of pastry dough and add 1 drop of red food colouring to it. Then use this to form the respective shapes of the beaks and the crowns and stick these onto the roosters. The challenge of making pineapple tarts into shapes of animals, especially that of a rooster, is that it’s really difficult to keep the pastries properly in containers without anything falling off. The beak is especially fragile and kept falling off the roosters! I am already halfway through finishing my tub of pineapple tarts. Not sure if the current stock could even last through the next week, but I sure am glad I gave this a try! For those of you out there who are celebrating this festive season, enjoy the last few days of the lunar month. Make sure to squeeze in one more lohei before it’s over! This entry was posted in Chinese, Pastry and tagged Baked, Chinese New Year, Pineapple, Rooster, Tart. Bookmark the permalink.